New Google Play Store coming for Android Jelly Bean? Is the Play Store about to get a redesign? 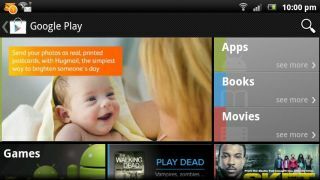 The arrival of Android Jelly Bean could also see the dawn of a redesigned Google Play Store if a leaked image is to be believed. The next version of Google's mobile platform, Android 4.1 – codenamed Jelly Bean, is expected to be unveiled at the Google I/O event this week. According to a leaked image of a Samsung Galaxy S3 screen, picked up by Italian site HD Blog after it appeared on the Google+ page of Loranz Yousif, the Play Store is set for a refresh alongside the Jelly Bean update. The redesign sees the return of the featured apps carousel which was a key aspect of the Android Market before it went under the artist's brush and arrived in its current form. Additional tabs have been included along the bottom of the screen, providing links to what look like movies, books, apps and music. However this image needs to be taken with a large pinch of salt as the source of the photo, Loranz Yousif, is failing to respond to comments regarding its authenticity, throwing the whole thing into doubt.